The winner of Irrational Games' BioShock Infinite "Name in the Game" contest now owns a stable of mechanical horses. Irrational Games previously held a contest that promised to name an aspect of the upcoming BioShock Infinite after a fan, and the company has delivered. One Payton Lane Easter is now the proud owner of a brand new automated stallion company. After receiving over 100,000 entries for the contest, Irrational unanimously settled on Payton Lane Easter's name . "We couldn't make up a more fitting name for a citizen of Columbia if we tried," Irrational says. Easter's award was to have a "premium automated stallion" company named after him in BioShock Infinite. 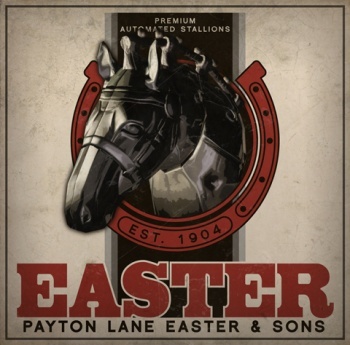 Irrational artist Mike Swiderek whipped up an advertisement for Payton Lane Easter & Sons Automated Stallions, which was established back in 1904, by the way. If you don't know what an automated stallion is, watch BioShock Infinite's 10-minute gameplay trailer here. Also, watch that if you just haven't yet. Trust me. Easter will likely stop outside of his establishment once he finds it in the game and proudly stare. I would. Interestingly, Irrational says that "another unique opportunity" will pop up sometime this week. I have a feeling it's a mustachio-growing contest, so get your wax ready.